Our Newfoundland brewery tour has been one of our favourite and most popular rackets we’ve published on The Racket. Our friend My Year in Beer began referring to the initial profiles as a “virtual” brewery tour because while we visited each of the breweries we profiled, readers were getting a virtual experience from our articles. We took ourselves and our readers on a literal virtual brewery tour when we profiled Storm Brewing last fall as they currently do not have a taproom or provide tours to the public. We’re doing it again in this profile, this time with the Newfoundland Cider Company, located in Shoal Harbour. The Racket chatted with the one owners, Danielle Poirier via email. The Newfoundland Cider Company is located in Shoal Harbour, which is about a five-minute drive from Clarenville and is made up of four long-time friends, Chris Adams and Marc Poirier, and their wives, Emma Adams, and Danielle Poirier. Chris Adams and Marc Poirier. (Photo courtesy of the Newfoundland Cider Company). Chris Adams lived abroad in Ireland for a number of years and was exposed to what Poirier called “proper Irish and English cider.” He took his taste for cider back to Newfoundland and began picking apples with his friend, Marc Poirier so they could make cider for themselves. Soon this “home brewing” hobby became more of a passion and Adams and Poirier began to take the necessary steps to go into business. This was back in 2016, but the Newfoundland Cider Company didn’t officially open, or start selling their products until 2018. We were interested as to why this foursome decided to get into the cider business, especially with the boom of the craft beer industry in the province. According to Poirier, it stemmed from Adams developing an intolerance to beer. He could no longer drink it, so he turned to cider instead. “Also, living in the Clarenville area, [there is] an abundance of lovely wild apples growing in the woods and along the coastline, as well as [a number of trees] trees on [Adams’] property, [so] cider making was a natural fit,” said Poirier. There are also no local cideries, and very few located throughout Canada, and even North America, so there was lots of room to play around. (Photo courtesy of the Newfoundland Cider Company). Danielle told us that Chris Adams enjoys French keeved ciders which are quite technical and hard to make. French keeved ciders are naturally sweet and carbonated cider. Marc Poirier prefers Irish ciders, like Dan Kelly, because he likes their well-balanced sweetness and carbonation. “Plus there's a real depth in the flavour, almost like you can taste the earth, which you just don't get in North American ciders,” she added. We have managed to try a couple of offerings from the Newfoundland Cider Company. The first was during Christmas when we shared their Forager Apple Cider during a family get-together on Christmas Eve. This beverage was quite enjoyable and tasted tart and oaky. 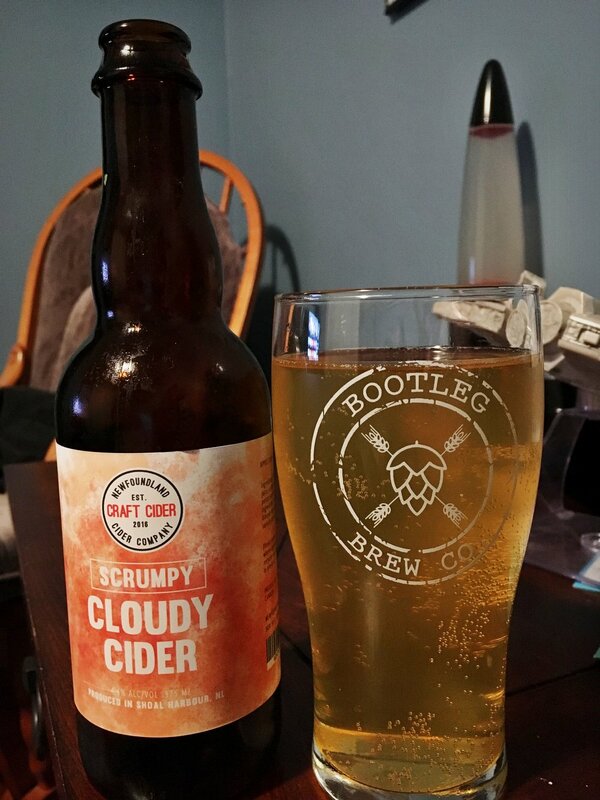 Their Scrumpy Cloudy Cider was also fun and quite likely will take you back to the days of drinking apple juice as a kid, except with the 4% alcohol. Poirier is very pleased with the public’s reception of the Newfoundland Cider Company. “We are so appreciative of all the support from everyone, the response really is overwhelming and we really didn't know what to expect when we started,” she said. “Of course, we get mixed reviews, but everyone has different taste and we know not everyone will like the same thing. So that's why we try to produce a variety of ciders from dry to sweet, and still to carbonated.” She said they are always happy to receive feedback and input as to what people want in future releases. As for what’s next, there are plans to have their own building on the same land the Newfoundland Cider Company is planting their orchard, and they would like to eventually open a taproom. There have also been initial chats, but no real plans for the Newfoundland Cider Company to team up with the local breweries on a product. Poirier said they are certainly open to collaboration. For now, you can purchase Newfoundland Cider Company products at select NLC locations, usually at Howley Estates. “We try to keep people informed on social media when there will be a delivery available,” said Poirier. “We are also available on tap at a few locations in the city, like Landwash Brewery, Chinched Restaurant, The Trinity Pub, The Guvnor Pub, and Toslow.” They also plan to re-release some of the ciders they made last year, such as Scrumpy, The Old Tilt, New England Style, and some botanical flavours, along with some new ones as well.